We all probably believe that we are good at brushing our teeth especially since most of us have been doing it for a very long time. The unfortunate news is that there are still a lot of people, both children and adults, that are not brushing their teeth effectively. While even ineffective brushing can help keep bacteria away, effective brushing of your teeth can provide more smile protection. Brushing your teeth effectively means removing more plaque and harmful bacteria from your mouth. Your dentist in Lafayette, LA, wants your smile to be healthy, clean, and protected, so here are six tips to help more effectively brush your teeth. In this instance, 2×2 means brushing your teeth at least twice a day for two minutes each session. 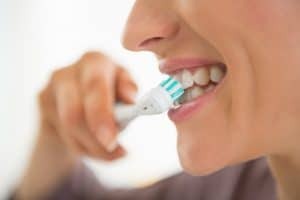 Brushing your teeth after every meal would be ideal, but realistically, once in the morning and once before you go to sleep can help your smile. Two minutes per session should allow you enough time to spend about 30 seconds on each quadrant of your smile, i.e. top right, bottom right, top left, and bottom left. Children are especially guilty of only brushing the fronts of their front teeth. Though, adults can skip surfaces, too. Remember to brush every surface of each tooth. This includes the inside of the teeth that faces your tongue, the tops of the teeth, and each surface of the hard-to-reach-teeth in the back of your smile. It is recommended for everyone to use a soft-bristled toothbrush. When brushing it is important to go hard enough to remove plaque, but gentle enough to not cause erosion to the teeth or irritation to the gums. Angling your toothbrush gives you a better chance to hit every tooth and to reach closer to your gums. Small circular strokes can allow you better, more efficient coverage. As stated above, it is important to be gentle enough with your brushing to avoid irritating your gums. However, it is also important to get your toothbrush as close to your gum line as possible to remove any bacterial build-up from those areas. Brushing your tongue is a great way to remove the bacteria that can build up on this spongy surface in your mouth. Ask Dr. Young for more tips for protecting your smile’s health. To schedule a consultation, contact us at our Lafayette, LA, dentist’s office at 337-237-6453. We proudly serve patients from Breaux Bridge, Broussard, Scott, Youngsville, and surrounding communities.